Durango Muffler & Brake Automotive, is a full-service, one-stop auto repair shop for all your car care needs. We offer everything from simple oil changes to complete engine and transmission overhauls, and of course, we’re the muffler and brake experts Durango drivers have trusted for decades. We also provide tune-up services customized for your car. Check out all we do! Drive away with confidence, not questions. 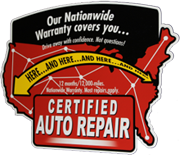 Most repairs performed by a Certified Auto Repair center are backed by a 12 month/12,000 mile nationwide warranty. Honored at more than 30,000 repair centers nationwide, the Certified Auto Repair Worry-Free Nationwide Warranty has you covered – no matter where your travels take you. If you’re experiencing a shaky, rough ride in your car or truck, your shocks could be the problem. Bring your vehicle to Durango Muffler & Brake Automotive for the proper assessment and repairs. If you’ve had shocks installed recently but something still seems off, stop by for an alignment. Shocks installed without this crucial last step won’t be nearly as effective or comfortable. Our team of professional mechanics can also handle any repair involving your suspension system, and we offer frontend alignments, too. Call or contact us online to schedule an appointment for any of these services. Durango Muffler & Brake Automotive offers a full range of diagnostic services for small and large vehicles. If you’re experiencing an unusual noise, shaky steering wheel, trouble starting, or any other unexplained problem with your vehicle, we can detect the cause. Our programmers, downloading devices, and other computer technology can be connected to your vehicle to uncover issues and pinpoint problems. Our experienced mechanics will also inspect and manually test your vehicle as needed. Together, we’ll be able to provide a diagnosis and schedule a service appointment in a short period of time. Durango Muffler & Brake Automotive also works on 4” and 5” diesel exhaust systems. We install new systems, make repairs, and replace system parts or entire exhaust systems as needed. For diesel exhaust system work you can count on, contact us and request an estimate. We offer standard (or manual) transmission replacements at Durango Muffler & Brake Automotive. Our staff can find the transmission parts needed for your specific vehicle make and model, and these involved repairs are easily done by our expert auto mechanics. Just bring your car in for an inspection and estimate and we’ll get started. Durango Muffler & Brake Automotive offers factory-scheduled maintenance for all makes and models. We’ll check your fluids, change them as needed, and keep track of when your vehicle needs particular services. Our technicians are as honest as they are skilled, so we’ll never perform a service you don’t need. As our name indicates, we are exhaust system experts at Durango Muffler & Brake Automotive. We can repair all parts of your exhaust system, including your muffler, tail pipe, mountings, gasket, spring, and other custom parts that pertain to your make and model, ensuring your vehicle runs quieter, cleaner, and more efficiently than before. Looking for a performance upgrade? Our exhaust experts also build custom exhaust systems, and we have a wide range of exhaust parts on hand. If your car or truck is due for emissions testing, come into Durango Muffler & Brake Automotive for quick and stress-free testing services. Our accommodating staff, up-to-date machines, and efficient technicians will have you in, out, and back on the road in 30 minutes or less. Our mechanics regularly repair and replace cool intake systems and components, including the OEM filter, air filter, and other parts that affect your fuel injection system and the temperature regulation of your engine. If you need cool intake system repairs, come in for fast, reliable service. Brakes unavoidably wear out over time. How long they last is based on numerous factors, such as where you drive and how you brake. For this reason, it is necessary to service your brakes regularly. We are familiar with the driving conditions here in Durango and know that your brakes need care. We even provide a complimentary inspection with every service to make sure that any problem is addressed before it becomes a major concern. At Durango Muffler & Brake Automotive, we build custom trailer hitches, so you can haul anything from a bicycle to a boat. Our professionals will assess the rear of your vehicle and go over the options that will fit your hauling needs. There are specific weight limitations depending on the size of your car or truck. We’ll let you know if it is safe to tow the item you have in mind.